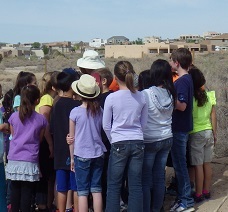 Through generous funding provided by Southern Sandoval County Arroyo Flood Control Authority (SSCAFCA), Ciudad SWCD’s Arroyo Classroom program for third graders began as a pilot in 2013 to promote safety near natural arroyos, awareness of the local environment and to teach students about the arroyos’ value as wildlife habitat. As part of the educational standards, Ciudad SWCD wants to inform students about habitats in their neighborhoods and the animals that make their homes in arroyos. Students learn that something as simple as “scooping the poop” (cleaning up pet waste), picking up trash and debris, and staying on trails to reduce erosion and sediment can have a direct impact on stormwater quality. Stormwater isn’t cleaned and carries whatever it picks up directly to the Rio Grande River. 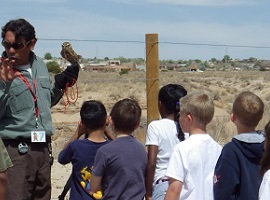 Students receive three in-class presentations, meet live animals they are learning about, and put their newfound knowledge into motion in a walking field trip near their school to observe arroyos, plants and animal habitats. For more information about the Arroyo Classroom Program, or to sign your school/class up to participate, please contact Ciudad SWCD at (505) 225-RIVR or ciudadeducation@gmail.com.